What a crazy week of fantasy football. I guess that’s why we love it. It makes all of the drama of the NFL that much more enjoyable. Let me start off by saying I had a very good fantasy week. Went 5-3 in players to start and 4-2 in my leagues. But it was very close to not being such a great Monday night for the Junkie. Michael Vick’s amazing performance on Monday Night almost took away a 70+ pt lead I had in one league. Thank goodness McNabb and the Redskins couldn’t get much going otherwise, I’m sure Vick would have had 100 more yards and possibly two more scores. As soon as Kolb took the field, a big sigh of relief came to me. A loss at this point in that league and the playoffs would have looked really far off. I must say this week felt like the week of the QB. I can’t remember a time in recent play that so many QB’s had such fantastic statistical performances in the same week. 13 quarterbacks posted 300+ yard games. 10 quarterbacks scored 3 TD’s or more! For some perspective, in week 9, two QB’s went over 300 and only four had 3+ TD’s. That’s a big jump in production. Curse you Aaron Hernandez. Seriously. 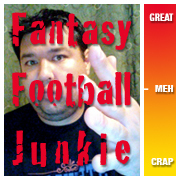 I needed 4 pts in a PPR league going into Sunday nights game and you get me a big fat zero? Come’on, you’ve gotten five points or more in 7 straight games. And the one league I can’t find a win no doubt. Oh well, time to play spoiler in that league! Well it’s time to start hunting the free agent pool for the next breakout QB. I don’t think Garrard will be this good again. Hmmmm… Shaun Hill goes up against the Cowboy’s in week 11. Tasty! I like Hill myself this week, but also like Kitna. If Dallas’ O-line plays as well as they did against the Giants Kitna’s value becomes legit imo.. Totally agree, they could both be potential starts this week. And Kitna has so many talented players around him. They just need to cut the false starts and other penalties. Yes, I would rather have Thomas at this point. Even without Johnson against a mediocre secondary, Evans couldn’t get much going. So it looks like defenses will key on Evans more. But as soon as you drop him he’ll probably have a huge game. Much like MSW, he’ll show up for 1 in 4 games and make you second guess. But overall, Thomas has been more consistent, you just can’t expect 50 yard bombs either. I think he’s solid for 4-5 catches and 50-60 yards a game.